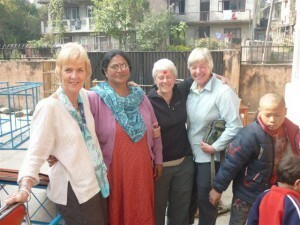 “In 2008 I was on one of my annual trekking trips. I was in Thamel outside Northfield café and spoke to Stephanie Roberson (a volunteer at the time) who was encouraging passers-by to eat at the café that evening. The café would donate money to Aishworya with every meal purchased that night. 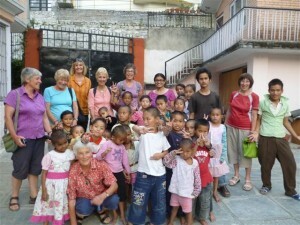 That led to me visit Aishworya the next day, meeting with Pramila and Nirmala (Aama) and all the children. I travel to Nepal every year, taking small groups trekking and now I always take my groups to visit Aishworya to introduce them to the wonderful work that the Ghimire family do. To raise money for Aishworya, before every trip I send out an email to my contacts asking for voluntary donations. The kids love it when Helen comes back to visit!